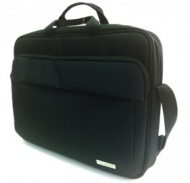 "The NE-TRLY Weekender Laptop Case by Belkin is a 'must have' solution for overnight business trips or short stays away from home. A perfect design for the active traveller, for professional or personal use, ideal for anyone who enjoys hassle free travel. The NE-TRLY not only features a stylish removable sleeve for added laptop protection, but... more also boasts a handy tabletop stow-away companion that stores all your essential laptop accessories. The main compartment easily stores all your vital personal items and provides feature pockets for laundry, shoes and toiletries."